"It's an old and very powerful idea, and now we have genetic evidence of how it happens in the wild," said coauthor Barry Sinervo, professor of ecology and evolutionary biology at UC Santa Cruz. Sinervo has been studying side-blotched lizards in California for more than 30 years. First author Ammon Corl, who earned his Ph.D. in Sinervo's lab, is now at UC Berkeley's Museum of Vertebrate Zoology. Corl said he first learned of the Pisgah lizard population from an unpublished Ph.D. thesis by coauthor Claudia Luke, now at Sonoma State University. "Claudia figured out how plastic their coloration is, and I tested for genetic changes that affected coloration in the Pisgah population," Corl said. "Baldwin predicted that plasticity allows organisms to colonize new environments, and they then develop new adaptations through natural selection. Until now, however, we have lacked the genetic tools to show this is going on in a field setting." 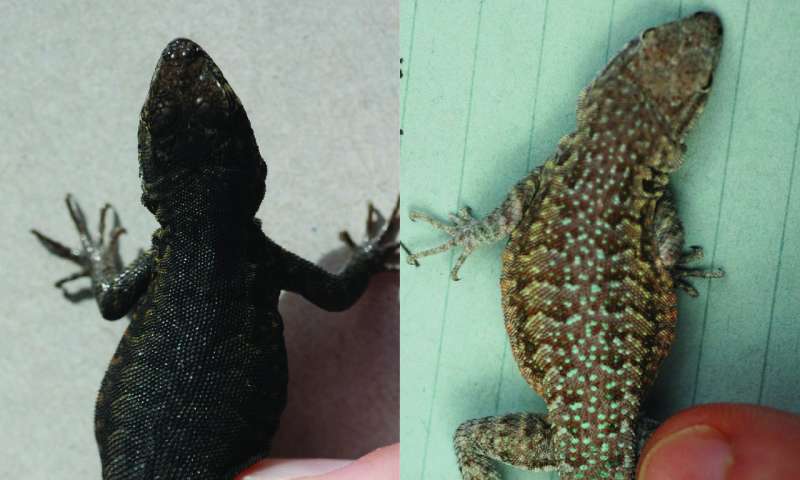 When researchers move side-blotched lizards from one background to another (for example, from sand to lava rock), changes in coloration start to appear within a week, and gradual changes in coloration continue for months afterwards. "It seems like there's a slow, gradual build-up of the dark melanin pigment," Corl said. The researchers cross-bred lizards from the two populations, raised the offspring in a common environment, and measured coloration of the offspring. Those experiments showed that variations in the melanin-related genes correlate with the darkness of the lizards' skins. Genetic sampling of side-blotched lizards surrounding the lava flow showed that the gene variants found in the lava population are restricted to that population, suggesting that the variants arose through mutations that occurred in lizards living on the lava and spread within that population. 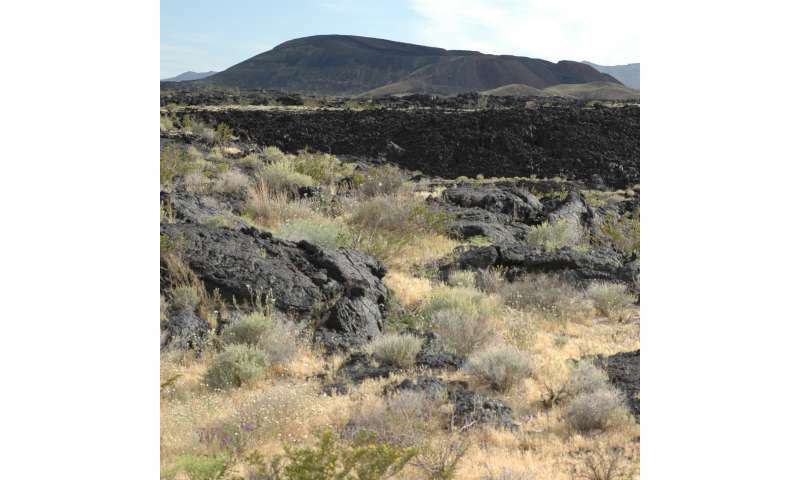 Demographic modeling studies suggested that the new mutations arose thousands of years after the lava flow occurred, about 22,000 years ago. "We've studied side-blotched lizards all over, even at another lava flow, and these genetic variants are only found at Pisgah, so we know that's where they arose," Sinervo said. "These are genes that govern coloration by controlling the melanin production pathway, but in a complex way. The Pisgah lizards have the best match to the color of the lava of any population, yet they can still go back to sand and match a completely different background." The range of coloration possible for an individual lizard is remarkable. "In some ways, it's amazing that natural selection still acts in the presence of so much plasticity. All it takes is a bit of a mismatch and that can make the difference between life and death," Corl said. "There is still variation within the population, so we caught natural selection in the process of acting on these genes. We can now conduct further field and lab studies aimed at better understanding how highly plastic traits are shaped by evolution." Among other things, it's still the same species of lizard. No extra genes, no lost genes, no genes changing position. There is a Lamarckian quality about this. But, note, how would the lizards' genes know what to change and how? It's not like cells or cell nuclei have analytical brains. It's not like they have eyes. Darwin, in fact, ascribes it all to randomness. I've mentioned this myself, how creatures not adapted to an environment survive in it long enough to "evolve" to fit it. One can suggest, in fact, God acts on the creatures. If one wanted an "explanation" that satisfied conventional "science" and didn't invoke God, they could say absolutely every single possible genome or information for them is in every cell somewhere and conditions make those qualities come out. This suggests, though, if conditions are extreme enough, a lizard can change into a horse, for example. One can suggest, in fact, God acts on the creatures. Only if one is scientifically illiterate, and a religious fruitloop, to boot. Or, the simplest possibility would be. Newly hatched lizards with skin tones that did NOT match the background colors? Were eaten while still too young before being able to reproduce. Take redheads for instance.... And please take them far away! Popular prejudice against that aubset has resulted in them interbreeding with other redheads. Passing on the genetic anomaly. Even though in all other ways (biologically if not socially) there are no true differences in Human Genome. Wow, you really know nothing about genetics or evolution, do you?